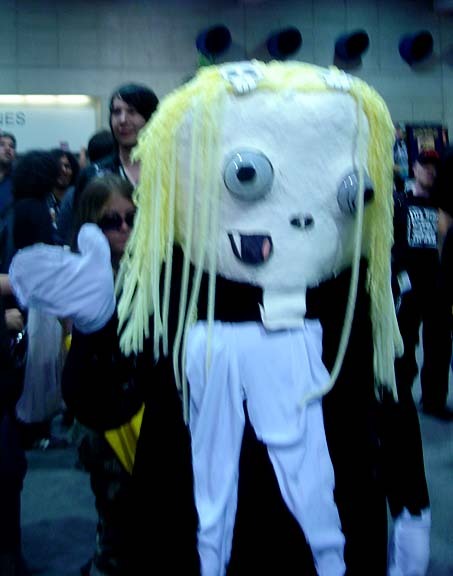 I'll start off today's newsletter by letting all of you know that I feel much better than yesterday. After I wrote yesterday's newsletter I managed to get myself back on my feet through a combination of sucrose tablets, salt, & lots of water. My friend, Dallas, also sent some very powerful prayers my way, which I'm sure helped. In any event, I was well enough last evening to auctioneer for the Comic Book Legal Defense Fund. We raised over $29,000 during the auction, which will help pay a great many legal fees needed for defending the right of free speech within the world of comics. I did also want to give you an update on the heat wave here in San Diego. 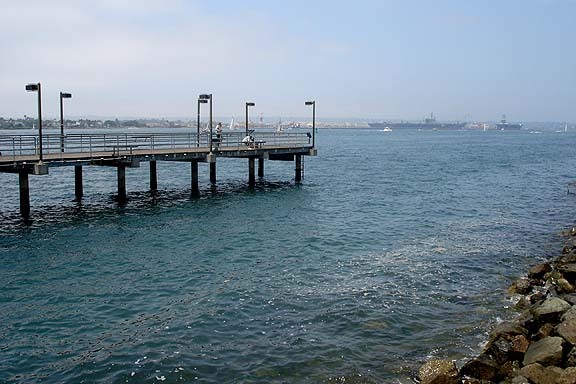 As a city surrounding a bay, San Diego typically is cooled by ocean breezes in the same manner as San Francisco. Yesterday, however, was an extreme exception. I checked the San Diego statistics for yesterday on weather.com via my laptop this morning, and discovered that the 99 degrees we hit yesterday was the highest temperature recorded in the city since 1930. The previous high for July 22nd was only 87, so the heat I was battling during my several long treks to park my truck was quite atypical. I realize, however, that there is no lack of heat around the rest of the country right now, with records being set everywhere, and misery being rampant. For everyone who is suffering from these abnormally high tempratures right now, I wish for you that you get some relief very soon. In other news, the number of people attending the show on Sunday this year is quite a bit higher than usual. I'm sure that yesterday's cut off of ticket sales caused more than a few fans to have to return today. I'm far from certain of the actual numbers, but fans entering the hall yesterday related that the line for tickets snaked around the entire building, and then went down the running path behind the convention center to Seaport Village. That's well over one mile. Even after you entered the building, it supposedly took another 30 minutes to register. Image the anger and dismay of those who waited for hours in those hideous lines in the blazing sun, only to be turned away when ticket sales were stopped in the early afternoon. The organizers really need to contemplate finding a way to not promote this show beyond its capacities. Not selling Saturday one-day admissions would be a good place to start. As an update, even today (Sunday) at 2 PM, there is a line of fans wanting to buy tickets that snakes over half a mile down the road. Since the show closes in just three hours, those folks have no hope of getting in for any appreciable time. Why isn't anyone solving this awful situation? 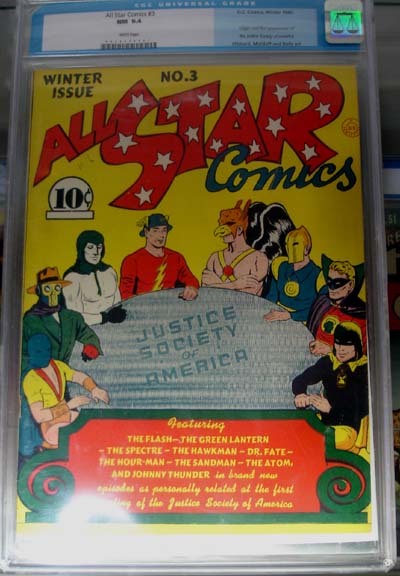 As regards changes in the world of comics that are reflected here at the show, one big difference that I'm seeing are the large number of licensing products featured in booths that have previously focused on printed materials. 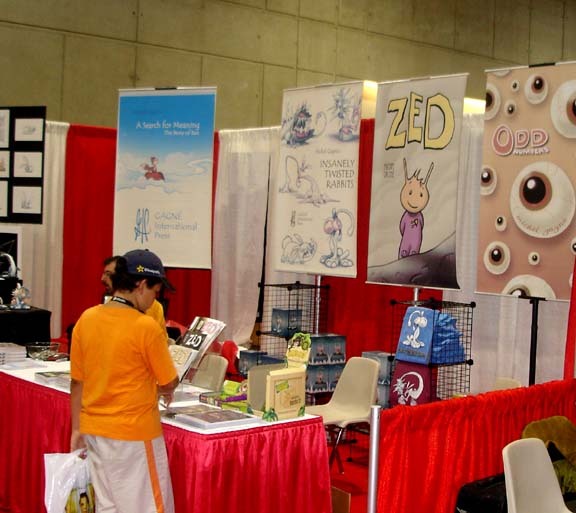 The Slave Labor Graphics booth, for example, appears this year to be a toy and t-shirt shop. 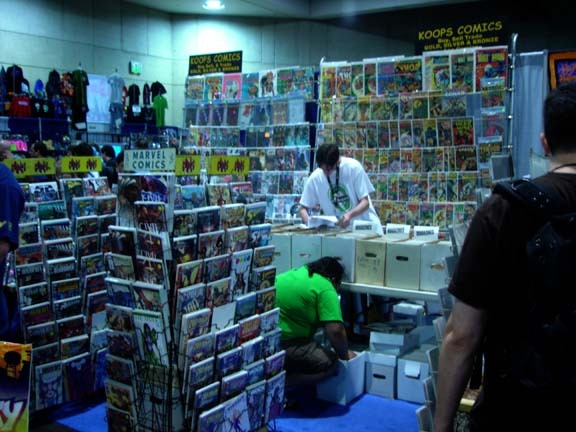 They still have comics clearly evident, but the focus is definitely on the licensing opportunities that can be derived from their comics properties, rather than the comics themselves. 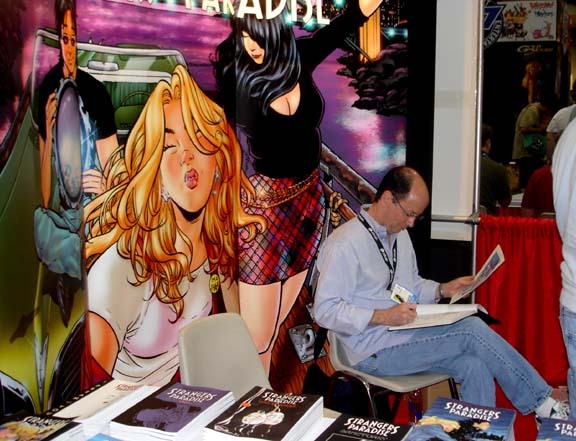 None of this is terribly surprising, however, as it is no secret that most comics publishers make far more money on licensing than they ever do printing books. 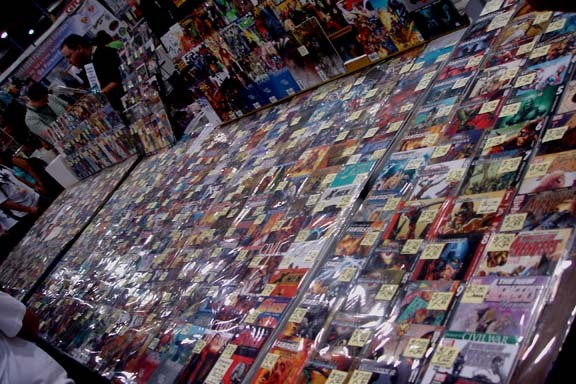 Marvel, for example, is rumored to have derived over $200 million in net profits from licensing last year, while the entire gross of the publishing division was a meager $90 million. 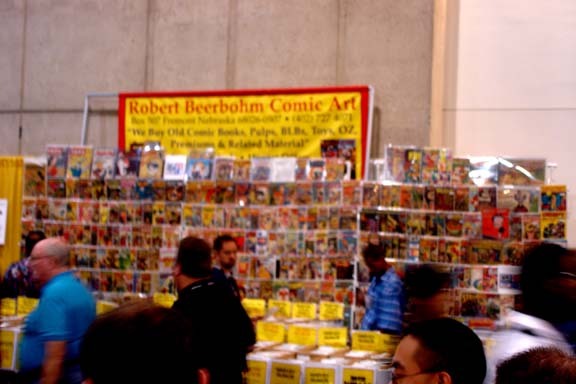 Even though I am very aware of the rationales for why all of this merchandising commercialism has invaded the comic-con, I am still a bit uncomfortable with the fact that the crassness of the south end of the building seems to be creeping so steadily northward. 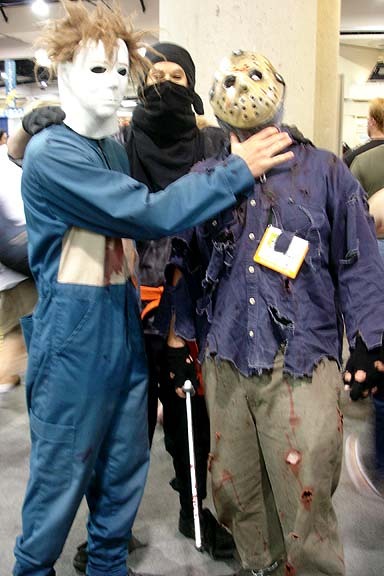 The way it is going, how long will it be until the idea is floated to drop the name comic-con entirely? 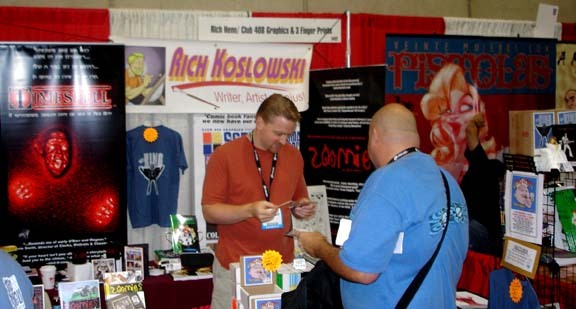 It has already become obsolete and unnecessary (even confusing to some extent...), as the convention organizers long ago allowed the Hollywood studios and the big toy and game companies to become their primary constituancy. That makes me endlessly sad, and full of regret for the innocence that we've lost. OK, enough complaining. 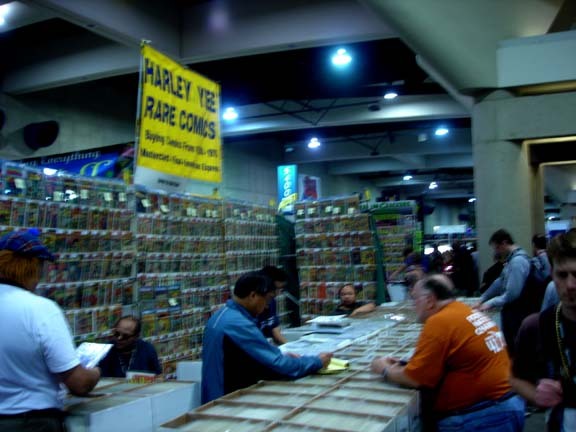 While comics have become a microcosm at the San Diego Comic-Con International, the number of great old comic books brought to this convention still exceeds that of any other show. 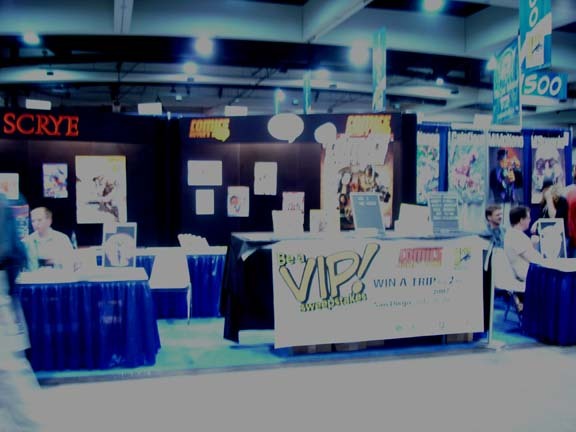 The booths are outrageously expensive at $1,8000 apiece, but so many well-heeled comics fans come here to buy that it is still the premiere sales venue for rare comics in the entire world. 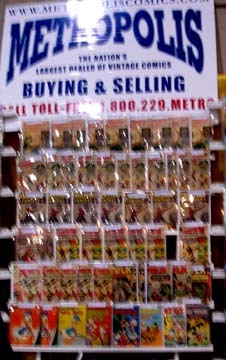 I had Pam run through the place taking a few random pictures of some of the older comics on display so that you could get a very little taste of the vastness of the selection of Golden Age, Silver Age, and Bronze Age on display. Do bear in mind, however, that there are few bargains to be had here. With hotel rooms at $200+ per night, and gas at $3.35 per gallon, everyone is having to keep prices higher in order to cover their costs. But if you've been seeking a comic book forever that we don't have in stock, the odds are very much in your favor that you will find it here. That's it for today's newsletter. 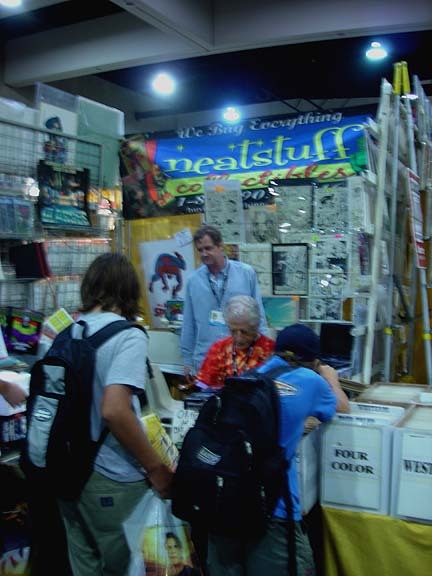 I could go on endlessly with observations about the convention, but Lynne and Sean need to copy edit my column, and we then need to send it out before they turn off our online connection. Then we have to begin the arduous task of packing up our remaining books. 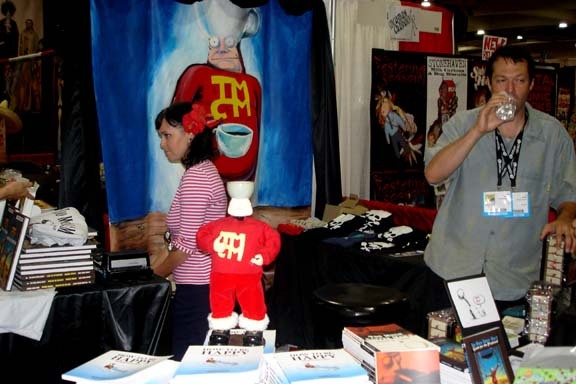 Speaking of which, while our sales here at the show set an all-time record (allowing us to actually break even! 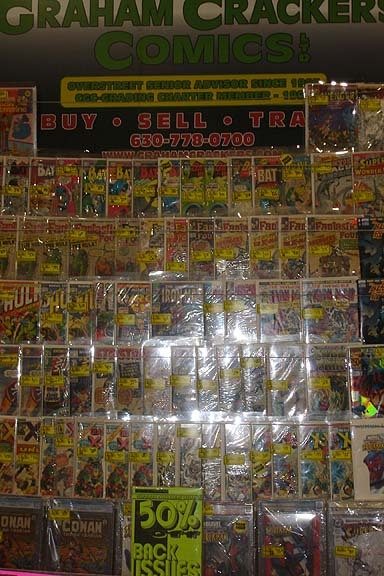 ), we still have well over 5,000 trade paperbacks and hardbacks left. That concerns me, as I'm reasonably certain that we don't have space to shelve that many books in our Fox St. warehouse. So I'm going to implement an immediate 40% off sale on all of our trade paperbacks and hardbacks. This sale will only last until next Friday at 10 AM, however, as I will have completed my return drive to Colorado by then, and we should have unloaded the two trucks. The 50% off SAN DIEGO codeword sale will also continue until my return, so you can mix 50% off back issues with 40% off trade paperbacks and hardbacks to reach the $40 minimum order to earn free domestic shipping. International customers earn free shipping at the $100 level (no express carries), with a small surcharge per each book to cover the addition weight. Don't forget that new comics and Dallas Stephens consignment issues are exempt from this sale. Other than those minor two exclusions, however, any of the back issue comics and magazines on our website are fair game at 50% off. That's an incredibly great offer, and even better, you don't have to stand in line for four hours to qualify!